As can be seen, the profit margins in the three different business units are very different. Batteries 7.0%, Handset 3.7% and Auto 9.0%. As of now most of the battery sales goes to BYD’s own vehicles in intersegment sales. So growth in sales in the Auto segment, will quickly increase profits on the bottom line. BYD surely has a lot of interesting prospects going on for the future, everything from solar panels and electricity storage to mono-rail trains in smaller Chinese cities. All these things could be great growth areas in the future. I chose to focus this write-up on the Auto segment and how the battery production is linked to that success. So just to be clear, when we are talking auto, I mean regular gasoline cars, electrics car and electric bus sales. For 2015 the sales of gasoline and electric vehicles were about 50/50 in terms of sales, but in the future the electric vehicle sales is assumed to push far passed gasoline. And already today, because of poor margins for gasoline vehicles, most of the profits comes from electric. At the moment for BYD I see greatest potential in electric bus sales. Electric buses is the one area where the company has managed to push past all the well established bus and truck makers and deliver a product in its own class, much thanks to BYD’s battery capabilities. BYD have produced 10 000 of electric buses since 2010 and from my point of view we are going to see something of the famous ketchup effect coming through in the next 2 years. As I have interpreted things, the main reason for BYD success with electric buses is that their battery technology is at the moment the perfect candidate to put in buses. They don’t have the most advanced technology in terms of energy density. But BYD’s batteries has good/fast recharging times are safer (meaning very hard to ignite), two aspects that are very important for someone buying a electric bus. In a car you need a lightweight battery with maximum energy density, in a bus it doesn’t matter if the battery weighs a little bit extra. BYD is also the only bus producer in the world with deep expertise and factories to produce its own batteries. I believe these facts around BYD’s edge in batteries is a very important insight for the probability of future success in electric bus production. 345 kWh (BYD LiFePO4-type lithium-ion batteries) good for up to 190 miles (305 km) of typical urban driving according to the internationally recognised SORT test conditions. seats for a total 54 passengers with a further 27 standees spaces (total passengers: 81). Their main backer on buying electric buses has been the Chinese city Shenzhen who purchased a huge number of buses so far and are running the world’s largest fleet of electric buses. For once, very impressive of China on the environmental front! It should be mentioned that Shenzhen just recently cancelled their latest huge order (1.8bn RMB) of buses from BYD. The reason? “Due to capacity adjustment, the procurement plan for 2,919 new energy vehicles (Batch 2) has been changed and the tendering process terminated,”. Well that comment doesn’t make you much wiser. Obviously this is negative, but I don’t believe it is because of quality issues. As most things in China it’s rather political or budget reasons for the city. But that one city (albeit a huge one) can make an order of 1.8bn RMB just shows the size of potential orders when this catches on in China and the world. I don’t like to use that kind of logic, but the number of cities in the world that would want to change to electric public transport buses is mind boggling. For so many reasons (pollution, noise, and actually also economics) they will come to this conclusion over the coming 5 years. The future is electric – and right now BYD is in the driving bus seat. To put some numbers on all this rambling. The cost of a full size electric bus (before subsidies) is around 2 million RMB. As a side note, it should also be mentioned that currently China is giving heavy subsidies for these buses (up to 1 million RMB, driving a lot of the sales and giving BYD a competitive advantage to competitors). The Global sales of all types of buses is about 600 000 every year. I believe a big player like BYD, with in-house battery production as its edge, within 10 years can catch 10% of that market, that is 60 000 buses a year. That translates to sales of 120bn RMB per year, 1.6x the whole company’s current sales, and that would be just bus sales. Again BYD’s edge would rather be in that they are a major battery producer and car maker, just as Tesla is trying to become with its Gigafactory. But for electric cars LG Chem, Samsung SDI and Panasonic in co-op with Tesla seem to have a technological advantage in terms of battery performance/density. So short term I can’t see BYD being a winner in the car space – except in China where the competition isn’t fair and BYD can enjoy subsidies and not being hit by import taxes. Since the Chinese car market is so large, being successful in China will go a long way, but as mentioned, there is many other Chinese car makers also wanting a piece of that pie. Maybe I’m sounding overly negative, BYD will for sure grow its sales in this segment, but it will be fierce competition on all fronts. As at 31 December 2015, the Group held a 65% stake in Hong Kong listed BYD Electronics, this stake is today valued at 8.9bn HKD in the market, a little less than 3 HKD per BYD share. As at 31 December 2015, the Group held 179,127,725 shares of Holitech, with market price today of 15 RMB per share, or about 3bn HKD, a little less than 1 HKD per BYD share . Holitech is the new owner of parts of the handset business previously run by BYD Electronics. Holitech bought the business from BYD in 2015, paid in cash and shares. Hence BYD’s large holding in Holitech. This is an attempt for BYD to focus on it’s core products and if BYD intends to keep its stake in Holitech or not, is still unknown. I would see it as a positive if BYD could get rid of these businesses and invest the cash in the much more profitable EV and battery business. As I have try to present, a sum-of-the-parts of BYD’s businesses shows that almost all the value lies in the future sales of electric cars and buses. My interpretation is that Mr Market is putting a too high value on potential car sales and too low value on potential bus sales. My assumption is that there will be a window of opportunity for BYD, to gain massive market share in electric buses for public transportation, with peak growth in 3 years time. My assumptions are that BYD will take a 10% global market share in the bus market in the coming 10 years. At the same time there is a window of opportunity also for the chinese market for plugin in hybrid vehicles. I’m much less certain for the long term growth case in cars. Other areas which we did not touch on are the growth in sales for Energy Storage Systems (ESS), which I see further ahead as a strong area also for BYD battery. Operating margins will also improve significantly when sales are tilted away from mobile to EVs. 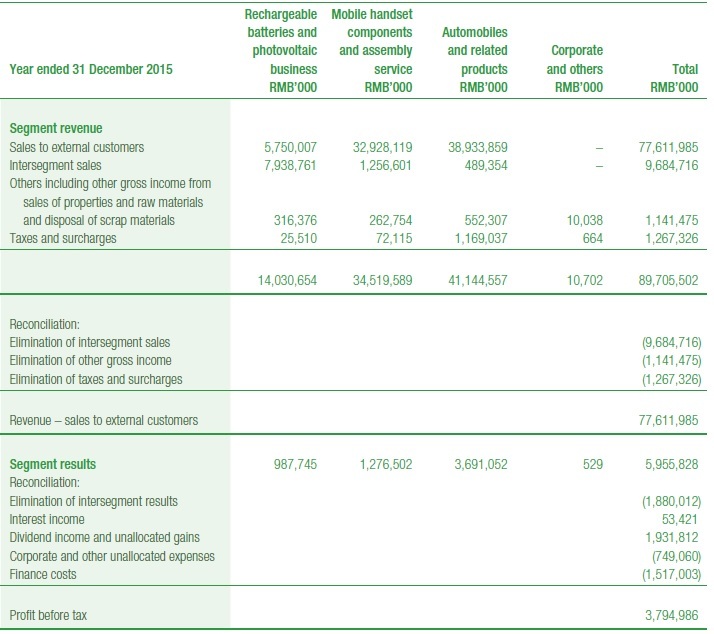 I use a 10% WACC, assumptions of heavy re-investments of profits in the next 4 years (negative Free Cash Flow) and all this gives me a fair value of 75 HKD per share. When I started writing this fairly long post BYD was trading around 46 HKD and now after announcements that Samsung is taking a stake in a private placement round, the stock traded up to 51 HKD. This valuation some would call a blue sky scenario and to a certain extent I would agree that it is optimistic. Although I’m very certain of BYD success in the area of buses. As a more bearish scenario BYD might not reach the high growth in bus and car sales, but someone else for sure will. So BYD will be able to supply the batteries for those companies. Such a scenario would obviously not bode well for the stock price. How bad? A proxy could be Samsung SDI which is more of a pure play battery-maker, it’s current market cap is about a third of BYD. Given that BYD is a even bigger battery producer than Samsung SDI a very bearish view on the company gives a floor around 25 HKD for the company. As you readers know I have a very bullish view of the future of EVs. I’m sure it will happen, just not who the winners will be. Looking at Tesla’s valuation in the stock market, it is clear these companies carry a big premium compared to BMW and others “old” car makers, which are valued at historically low P/E multiples. Most of BYD’s stock valuations is not a reflection on current profits, but an assumption of rapid profit growth over the coming years. Mainly from battery and electric vehicle sales which has better profit margins than the mobile handset business. To invest or not is based on the belief in this success, it has been a bumpy road so far as an investor, and I expect it to continue to be so. If you are a believer as I am, take advantage of the dips and buy, otherwise stay out.